An important contributor to adolescent girls’ and young women’s (AGYW) vulnerability to HIV is power differentials in their sexual relationships with male partners. Therefore, engaging male partners of AGYW is critical to reducing HIV incidence among AGYW. 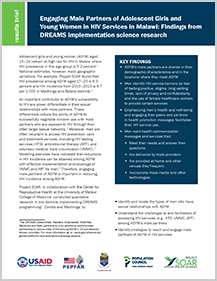 This brief summarizes findings from a study in Malawi that engaged men in discussions about their experiences with and needs for HIV services.